Last week, my wife Cinnamon and I made the trip over the hill to Santa Cruz to visit Sean Venus at Venus distillery. We were both very excited about this trip, as we have enjoyed many bottles of the Venus gin over the last year or so, and it has become a real favorite of ours. We were very impressed with both what we saw and learned as the high quality of the finished spirits here are the product of careful sourcing of organic ingredients and careful hands-on distillation in two small pot stills. Venus is located on the West side of Santa Cruz; just minutes away from the Natural Bridges Park that is often home to hundreds of thousands of monarch butterflies. Cinnamon and I picnicked in the park before heading over to the distillery, and I would recommend anyone who visits to do the same. It is really something to see! The Venus facility used to be the home to Sarticious distillery, but all of the equipment is new, brought in specifically for the kind of spirits that Sean wants to make. All of the ingredients are sourced from organic growers and in the most basic and unprocessed form that they can be purchased—unmilled barley grains for the base spirits, whole cardamom pods for the gin, whole citrus fruits for zesting etc. When possible, they work with local ingredients, like Jacobs Farm bay leaf for their gin. I found it interesting that they do very little marketing when it comes to the organic ingredients, and Sean said that was because they are using them for quality, not for publicity (a rare sight these days). They use two copper alembic stills from Spain at Venus; one that's 1000L and the other 600L. It was very difficult to get exactly the right stills all the way to Santa Cruz! We tasted through the entire line of Venus products and the biggest surprise was the fabulous Aquavit. I have never had a spirit with such a strong anise component that stayed in such lovely elegant balance before. The high quality black licorice aromas and flavors were a real revelation. The Blend No. 1 gin was the spirit that inspired the trip over to Santa Cruz, and it did not disappoint. When I first tasted it in August of 2014 I wrote the following review: “This one is coming home with me! I love it when a local, small production product delivers not just quality, but also excellent value. The wonderful, creamy texture of this gin is balanced by high toned citrus and grounded by clean juniper. I can't wait to get some fever tree tonic, lime and obnoxiously large ice cubes into this... It will be hard just to have one.” This is in the top echelon of gins worldwide, and I would put it in on the table next to anything. At the price, it is peerless. If you love gin and haven’t tried it, you are cheating yourself! If you are interested in barrel-aged gin, the Venus Batch No. 2 should be the first one you try. Sean was inspired by Manhattans when creating this, and it shows through in the finished product. The base spirit has a custom blend of botanicals meant specifically to be aged in barrel and it rests for two months—half in new oak and half in one year old 53 gallon, number three char American oak. I have to say my mind went straight towards a Negroni when I tasted it, and I love the bay leaf and spice in this top quality gin. Our very good friend (and great K&L customer) Brian joined us for the visit, and afterwards we went over to his place. 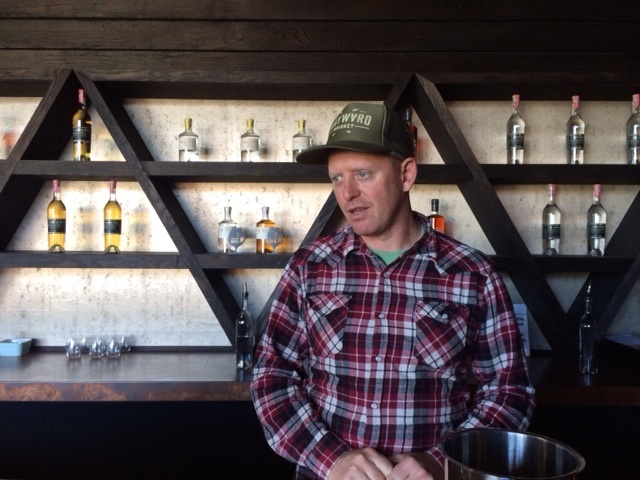 He is one of the best home mixoligists that I know, and he was eager to try his hand at a Pegu Club with the Venus No. 1. This is Sean’s favorite cocktail to make with his gin, and Brian’s rendition did great justice to Sean’s recommendation. The combination of this great gin, lime simple syrup and angostura did the trick. And now I have another must-drink gin cocktail on my growing list!